Charlton have had a £1.3m bid for Sheffield Wednesday defender Madjid Bougherra rejected. The 24-year-old has been in fine form for the Owls since joining from Crewe in the summer and has been an ever-present this season. 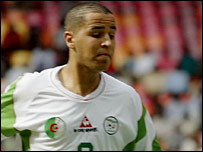 Sheffield Wednesday chief executive Kaven Walker confirmed the Addicks have tabled an offer for the Algerian. He told the club's website: "We have rejected a £1.3m offer from Charlton Athletic. He is not for sale."